As I wrote in a recent post, I have begun to learn a little Japanese using Duolingo. What attracted me in the first place was the promised ‘Learn Japanese in 5 minutes a day’. I cannot usually read the blogs I follow, let alone comment on them as I like to do, over my morning tea (Yorkshire tea of course! ); the same often applies to messages received on Messenger. But something ‘useful’ I could do in those few minutes appealed to me so I installed the duolingo app on my iPad. Ten lessons completed I can say that ‘learning Japanese in 5 minutes a day’ is not quite true; ‘Learn a little Japanese in 5 minutes a day’ would be more true. In the first two or three lessons I was repeatedly clicking the ‘report’ button when what I was hearing (the ‘characters’ are vocalised, which is great) did not seem to match up with the ‘spelling’, in English characters, of the sound. There did not seem to be anywhere any explanations of this, or of many other things encountered in the lessons, which further confused me. Hiragana, hirakana – let’s call the whole thing off! At the most basic, each of the groups of ‘5 minute lessons’ is titled ‘Hiragana #’ but what on earth is Hiragana? It’s not the obvious ‘Lesson’ but a Japanese syllabary script, one component of the Japanese writing system. Note the “one component”! 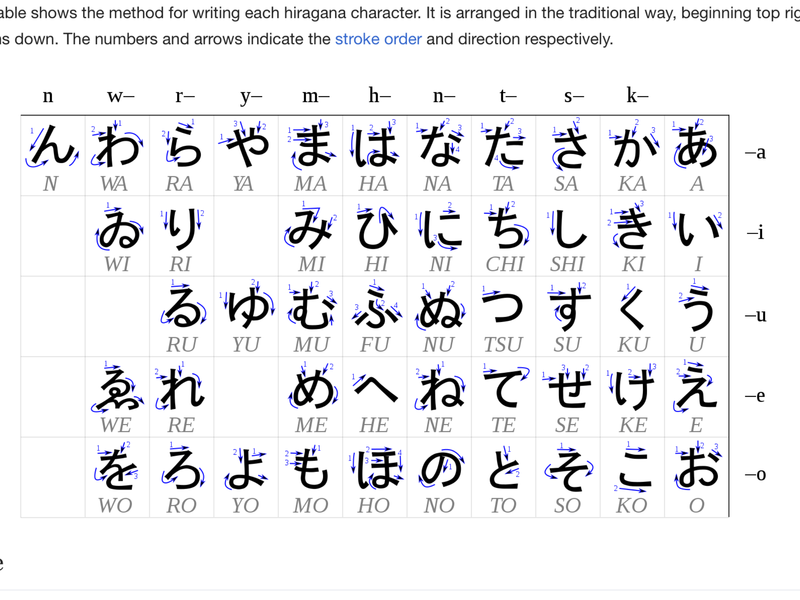 However, there are only 48 Hiragana ‘characters’, so that doesn’t sound too bad. So, we are learning one Japanese syllabary script – Hiragana. Fine. Once you get the idea of using sounds rather than consonant plus vowel it’s not so bad, so ひ–ら–が–な vocalises as hi-ra-ka-na. I’m not going to get into the ‘ga’ being ‘ka’, there is no ‘ga’ as such, but you can understand why I was confused at the start. Then, for some reason I cannot remember, I opened duolingo on my Macbook, not the ‘app’, and discovered another world. In particular I found there was a forum for each of the languages. So I posted a question on the Japanese forum, something like ‘Why are there so many mistakes in pronunciation?’. Almost immediately my question was answered (they were not ‘mistakes’) by other users. These answers made me trawl through many forum postings, by the end of which I knew much more about the Japanese language, and duolingo Japanese. That probably took me 12-24 5 minute lesson times. Hang on! In the forum words like kana, kanji, katakana, are bandied about; what on earth are those? It turns out with research (thank goodness for Google and Wikipedia!) that kana are the syllabic Japanese scripts, including hiragana; katakana and kanji are others (note I didn’t say ‘the others’). I understand that to find your way about Japan, or to read a newspaper, you will have to learn about 2,000 Kanji ‘characters’, more complex like this 漢字 – that is ‘kanji’ written in kanji. I haven’t been but how much better it would have been if there was a short ‘introduction’ explaining these things, before you begin the lessons. I don’t know whether some similar confusions exist for beginners with other languages; I could check with a language I know well – Romanian – or a few I know a little – French, Spanish, Italian – but to be honest I’d rather spend the time exploring other sources for the Japanese. Our fridge door. The magnets and ‘common English words), remaining from many more after some 14 years when Petronela was learning English, will be replaced by kanji when I begin to try to learn them. I have never been good at learning languages in the classroom but picked up the essentials rapidly when living in, or visiting frequently, the respective country (France, Spain, Italy, Romania), but forgot them equally rapidly when that was no longer the case. So a little further down the road I’ll take the opportunity to speak with other learners or, if possible, Japanese natives. 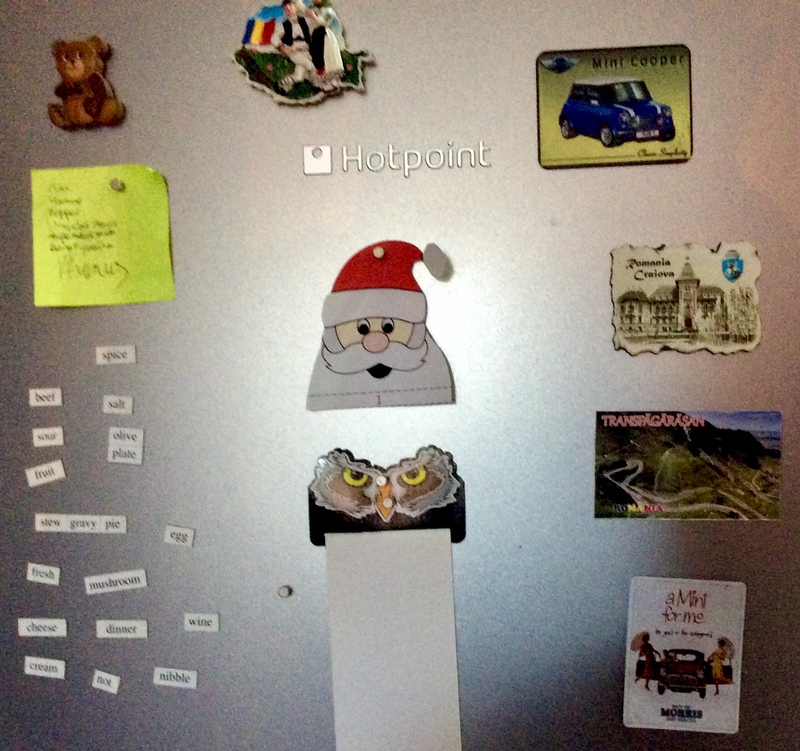 When it comes to learning kanji, I’ll resort to what I did for my Romanian wife when she first came to the UK with no more than 8 words of English – cover the fridge in stickers, in her case common words, for me kanji ‘characters’. I already write the hiragana in a note book as I’m doing the lessons and I’ll begin to do that correctly following the guide I’ve found (see picture above). It’s unlikely I’ll visit Japan again (I was there for about 2 weeks in the late ’60s). However, even now, ten lessons in, I see why I came to the conclusion instinctively, as I posted here, that ‘haiku’ written in English are not haiku at all. If my learning efforts allow me to write a haiku in Japanese with which I am satisfied it will all have been worthwhile.